GOOD QUALITY: Made of non-toxic and super absorbent polymer developed specifically to imitate real snow. Non-toxic, non-agglomeration, non-stick,looks real,high expansion. HOW TO USE: Powder Water Subscription Ratio:1:25 to 30/kg. Add 25-30 times water and the magic snow is free to expand.Attenion that too much water will make the artificial snow soupy and mushy. DURATION: Last outdoor in the sunlight for 1 to 3 days,in indoors for 10 to 15 days.If it dries out a little, just spay water on it to re-hydrate. 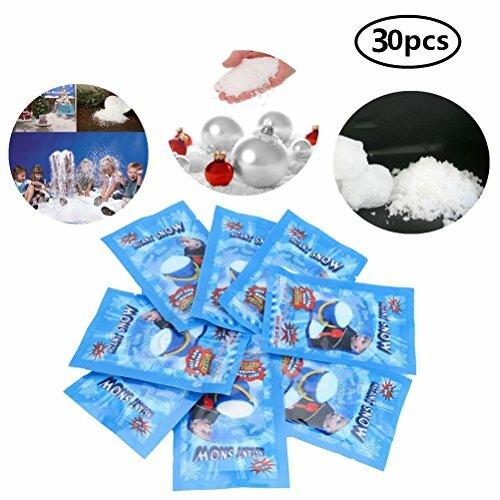 PERFECT FOR: This artificial snow can be used year-round for snow play, holiday displays, special events, party favors, floral arrangements and more. If you have any questions about this product by Eshylala, contact us by completing and submitting the form below. If you are looking for a specif part number, please include it with your message.